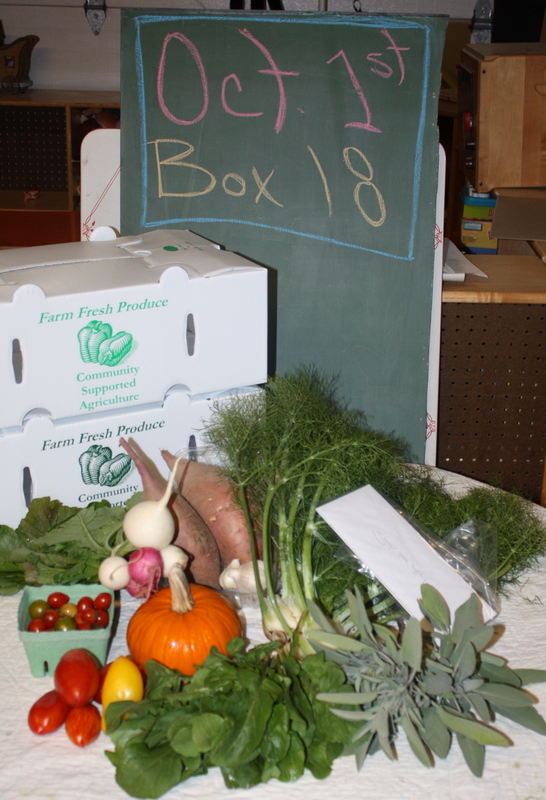 This week is Box 18….I have no idea why I wrote on the chalkboard 18 last week-everywhere else it was correct as week 17. Sorry for the confusion. 2 more weeks to go. Last box pick up will be Monday October 15th. Please take a look around your house if any extra white CSA boxes are hanging out and try to get them back to us by the last day. Thanks! We’ve been busy with getting the garden ready for winter. Scott and Malachi worked hard getting the tomato patch cleaned out. Not a small job. We like to get all the tomatoes off the ground and out of the garden so we do not have little volunteer tomato plants sprouting up everywhere in Spring. We compost the tomatoes and vines separate from our “normal compost” in order to keep the seeds out as well as the possibility of disease. 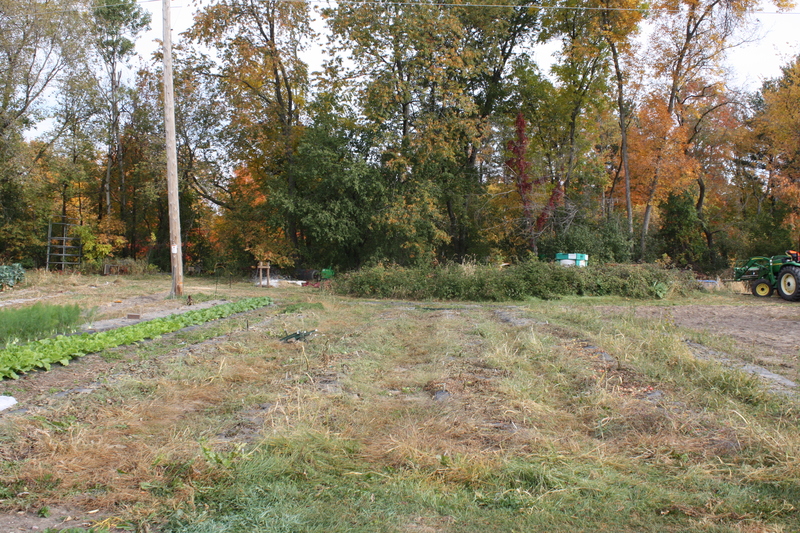 The eggplant has been cut down and the watermelon patch is cleared. It looks pretty barren in this back areas of the garden that was such a huge producer for us all summer. Scott will get some winter rye in this week as a “green manure” to be tilled in and replenish the soil for next year. 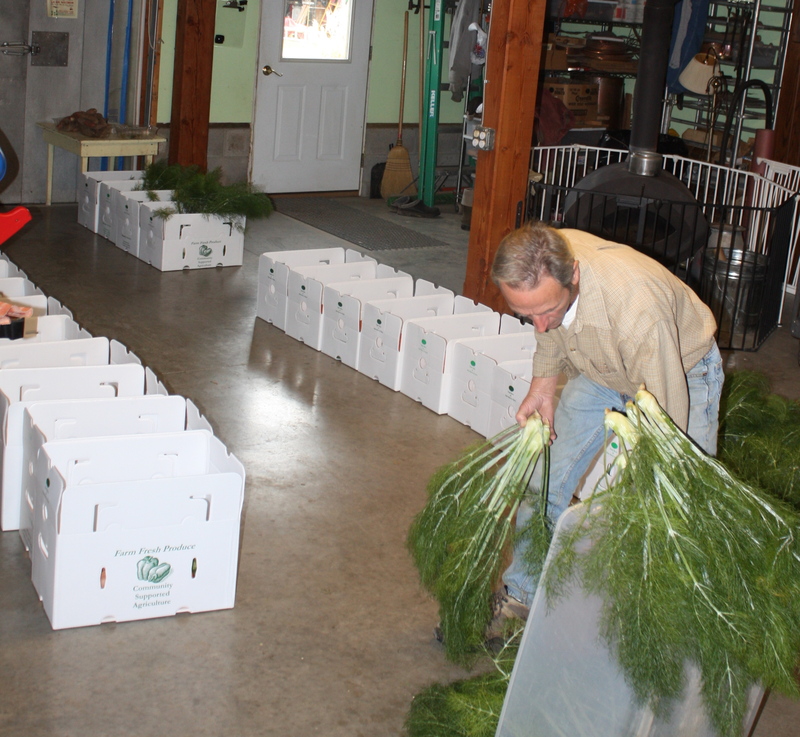 The City of West Baraboo drops off several loads of leaves to us each Fall and we compost them down for the garden. When the trucks keep backing into the yard several times a day and the Mountain of leaves pile high it gets pretty overwhelming. Scott moves them to the back of the garden with the tractor and they cook down to wonderful fluffy mulch for the garden the next year. It is worth it but I always have to have at least 1 huge freak out moment when I hear the beeping of the trucks as they start backing in the yard and wonder how we are going to deal with it all…..
We are still watering and irrigating our Fall and Winter crops as it is quite dry. We are also focused on giving all the berries bushes and fruit trees a huge drink in preparation for the winter. The leafy greens are loving this weather and we planted one more rotation of radishes just for fun to see if they make it in time for the last box. Sweet Potatoes-3+ pounds for everyone…..We have cured them in the warmth of the greenhouse so they are ready to eat. Delicious. Keep them at room temperature as they do not like to be cold. Fennel-Beautiful! We love the flavor of this tasty treat. Great shaved with a tossed green salad or all on it’s own with oranges. Adds great flavor to fish, chicken or pork chops. I like to make a potato gratin with it as well. Turnips-These pretty gems are back! We love to eat them raw. The white ones are a favorite in our house. Remember the greens are delicious too raw or lightly wilted. Packed full of nutrients. Prepare as you would Spinach. Arugula-The first cutting. A spicy leafy green that loves the cooler temperatures. We eat it on our sandwiches, in salad or wilted in soups or stir fries. Tastes great on homemade pizza with fennel too. Try it. Pie Pumpkin-Cook as you would any winter squash. I made cookies last week with one and a creamy soup. The flavor is sweet and rich. Will hold will for several weeks on the counter. Sage-The herb of the week. A nice size bundle. Dry it for the months to come. Remember a little goes a long LONG! way. Cherry Tomatoes-Last pint of the season. Paste Tomatoes-The last picking before the freeze. Survey-We have included the 2012 Survey in everyones box. Please take the time to fill out and return to us by the end of the season. We love to read your thoughts, reflections and suggestions. The tomato and eggplant area of the garden all cleaned up. This weeks project! See those tall green sunflowerish plants in the background???? Sunchokes or Jerusalem Artichokes. We will dig them for next weeks box.